Hills Science Plan Healthy Development Kitten Food Pouches (Favourite Selection) is a range of delicious meals that have been formulated to support immunity and the digestive health of your kitten. 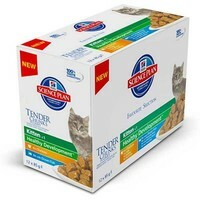 Made with high quality ingredients, the tender chunks contain exactly the right combination of vitamins and minerals your kitten needs for healthy growth, and balanced sodium and phosphorus levels to sustain healthy vital organs. Chicken, pork, wheat flour, salmon, protein powder, calcium sulphate, cellulose, DL-methionine, L-lysine hydrochloride,syrup, taurine, L-tryptophan, magnesium oxide, vitamins and trace elements. Chicken, turkey, pork, wheat flour, salmon, protein powder, calcium sulphate, cellulose, DL-methionine, L-lysine hydrochloride, syrup, taurine, L-tryptophan, magnesium oxide, vitamins and trace elements. Chicken, salmon, wheat flour, protein powder, calcium sulphate, cellulose, DL-methionine, L-lysine hydrochloride,syrup, L-tryptophan, taurine, potassium chloride, vitamins and trace elements. My two kittens love this food, and the VetUK offer of 20% off made it very good value for money. Two paws up! My 7 month old pair of Tonkinese kittens like this best of all, the chicken variety is top favourite. I agree it is good value. They certainly seem to thrive on it. My Abyssinian cats love this - the only better thing is chicken breast! I like it because its easy to store, doesn't need chopping up and is clean to put into the bowls. They also like the Ocean fish although I only give them this now and again and never more than a quarter of their daily. I also think the 15 pouches are very good value for money.